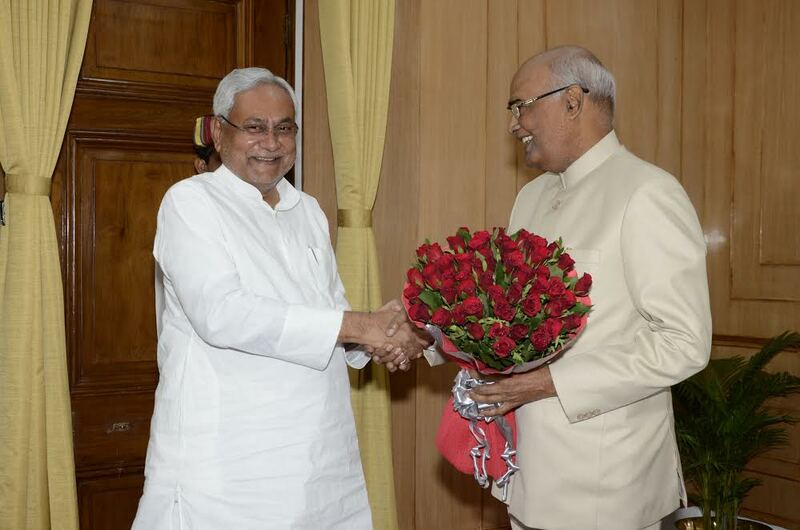 PATNA: Bihar chief minister Nitish Kumar who heads the ruling Janata Dal United may lend his support to the NDA’s Presidential candidate Ram Nath Kovind given his way of thinking, according to media reports. Firstly, Kovind as the governor of Bihar has never been involved in any controversy. Secondly, he has always maintained very good relations with the state government. Thirdly, Kovind being the governor from Bihar further strengthens his position. Forth, Kovind had given his assent to state government’s rather ‘draconian’ excise law imposing total ban on consumption and sale of alcohol in Bihar despite opposition from his own party, the BJP, and has always supported the state government’s policies. Only on Sunday, hours before his name was announced as the NDA’s Presidential candidate, Kovind had praised the state government again saying “Bihar education system is on the right path”. “Bihar me shiksha ki sthithi sahi raste par aa rahi hai,” was how Governor had said addressing 61th foundation day of AN College in Patna. The comments came amid a series of toppers scandals rocking Bihar, bringing much embarrassment to the state government. And lastly, the chief minister is known for taking an independent stand over the issues of national interests in sharp contrast to his allies. In the last 2012 Presidential polls as well, Kumar had backed UPA’s Presidential nominee Pranab Mukherjee against BJP’s official candidate PN Sangma. At the same time, Kumar has also supported surgical strike and demonetization drive of the Narendra Modi government at the centre, indicating his independent stand. That Kumar may take a different stand than his Grand Alliance partners, such as the RJD and the Congress, became visible when he rushed to meet Kovind at Raj Bhawan moments after he was declared as the Presidential candidate. Also, coming out of the Raj Bhawan, Kumar not only showed praises on the Governor for his conduct but also said he personally was very happy over his candidature for country’s top constitutional post.